Our Melody was princess of the day. You could see the white chairs from a distance that told the world, “Wedding!” It was a romantic outdoor setting, under a canopy of majestic old oak trees, appropriate for wedding vows spoken with lifetime integrity. Lights in the trees, mason jars with flowers, and popsicles brought whimsy and laughter to the celebration. (There was an evening breeze that made the air surprisingly cool. I was thankful for the warmth of my handwoven huck lace bamboo shawl.) Everything beckoned guests to come closer. And if you were close enough, you could smell the fragrance of the purple larkspur in Melody’s bridal bouquet! 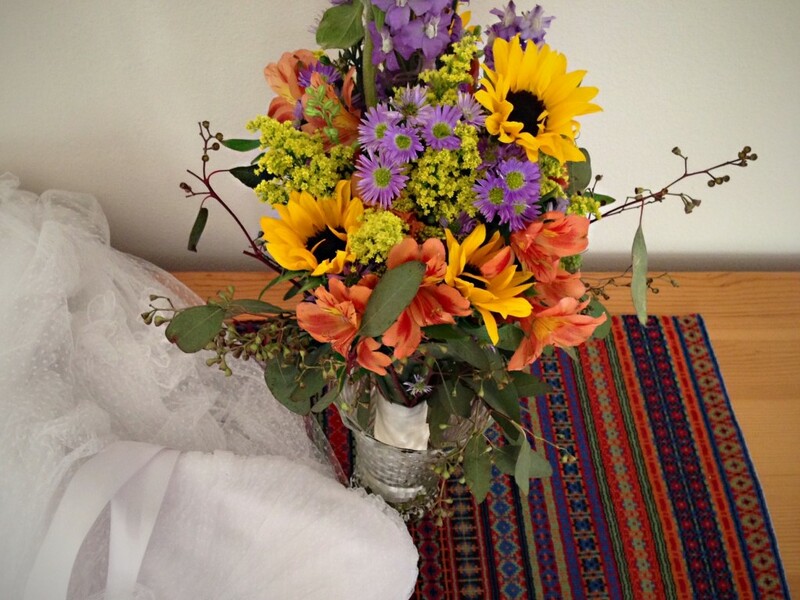 Melody’s bridal bouquet in her grandmother’s Fostoria vase, rests on my handwoven bound rosepath piece that is laying on the hope chest built by her father. Melody’s memorable wedding dress completes the scene. Our heavenly Father is like that, beckoning us to come take a closer look. Close enough to enjoy warmth in the breeze, smell the flowers, and wonder at the mystery of true love. 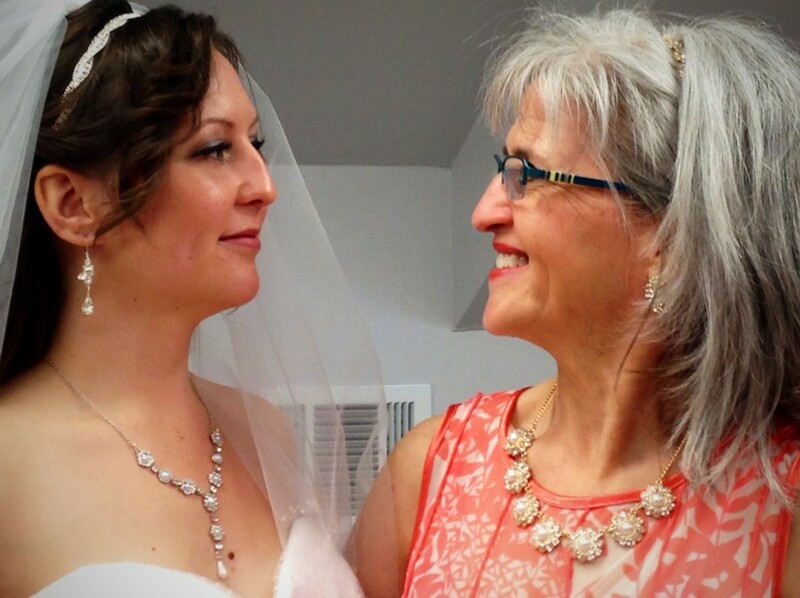 Bride and Mom sharing laughter and smiles just before the wedding! May you come close enough to enjoy the details prepared for you. Congratulations! I have been thinking about you a lot this last week. Especially on Saturday, which came up with the perfect weather for an outdoor wedding ceremony. The two of you are so beautiful! A wedding day is a very special day, not just for the bride, but for the mom, too. I am very happy to have realized that being a mom doesn’t stop on our child’s wedding day 🙂 To have learned that there will be many more very special days to share — where we are brought closer together in “good times and in bad”. Which is something that has made me, if not enjoy, so at least appreciate the value of bad times as much as the joy of good times. From one mom to another! I appreciate your wisdom, Elisabeth. I’m always learning from you! The weather couldn’t have been better. We were so very thankful for a beautiful sun-shiney (but not too hot) day!